These Australian Made balls are burst resistant to 350kgs and are extremely resilient. Burst resistance means AOK Swiss balls are designed to slowly deflate if accidentally punctured. We also test for deflation under load and durability using cyclic testing. 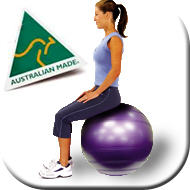 mediBall retains its shape under heavy loads, maximising the body's stabilisation process. It is ideal for seating, exercise, rehabilitation and can be used with duraDiscTM airRollerTM, medicineBallsTM, BallWebTM and weights to gain a more challenging workout. Also improve your posture, reduce back pain and brighten up your office/classroom - they make great and colourful seats.